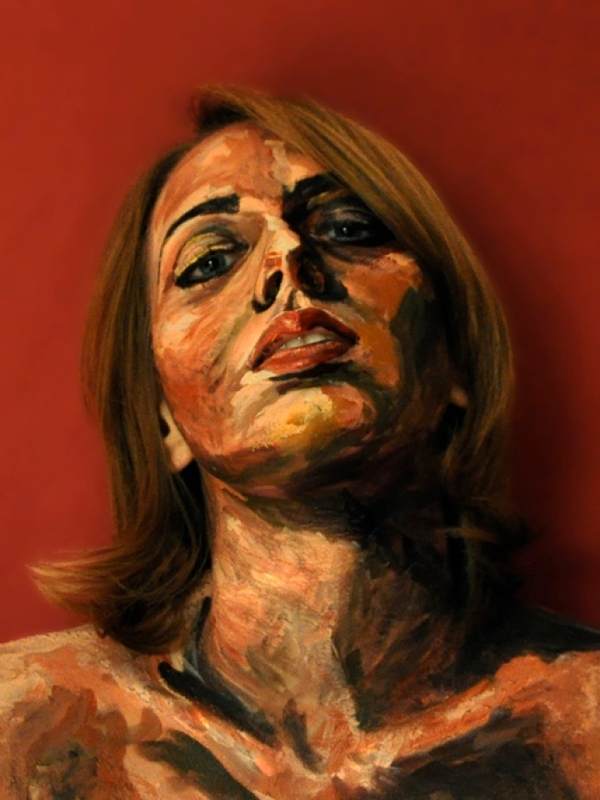 Alexa Meade, Portrait of a Self Portrait 3, 2010. Her method is certainly novel. Young D.C.–based painter Alexa Meade uses painting and photography to make very traditional portraits. What is unusual about them, of course, is how she flirts with trompe-l'œil -- the process of fooling the eye into seeing something that it is not. In the video, Meade talks to al-Jazeera about her artistic process. She paints her subjects directly, applying acrylic to their skin, forehead, eyelids, lips and ears. Clothing, too. After prepping her subjects, she then photographs them, typically in front of painted backdrops -- which flatten her sitters into faux-paintings in her backdrops. The works are definitely portraits. Meade -- whose summer show garnered a lot of attention for the 23-year-old artist -- has put the process forward with the work. For her exhibit, Meade offered live Saturday demonstrations in the gallery. Gone from that discussion is any talk about the photographs themselves, which get lost in the mix. Much like the way work is exhibited at the National Portrait Gallery -- where the portrait's subject often takes priority over the portrait's artist -- Meade's work emphasizes process and person. In fact, the best part of the work may take place in the photographs. It's the parts of people that she leaves untouched that dazzle in her photographs: eyes and hair. Granting that the illusion is real and the photograph is of a painting and not a live set, the viewer wonders: Can paint make eyes and hair look as real as photographs? That inadvertent tension is at least as interesting as the artist's tricky set-up.